Hiking up to the highest mountain in Hong Kong, The Peak, is a joy that I have discovered recently living on the South side of Hong Kong. Whether I do this walk with a friend or all by myself, the 30-45 minute journey amidst lush greenery and the sound of nothing else but the chirping of the birds gives me the much needed peace of mind and breath of fresh air that inhabitants of all big cities thirst for. The fact that I can do this within a 10 km radius from home is unbelievable! Standing at 552 meters above sea level, the Peak is the highest mountain on Hong Kong Island and used to function as a signalling post for incoming cargo ships in the nineteenth century. Preferred as a summer retreat by the British ‘tai-tais’, the Peak became very popular for the more privileged upper class who transported themselves up the treacherous slopes sitting in a sedan chair carried by their own personal staff! 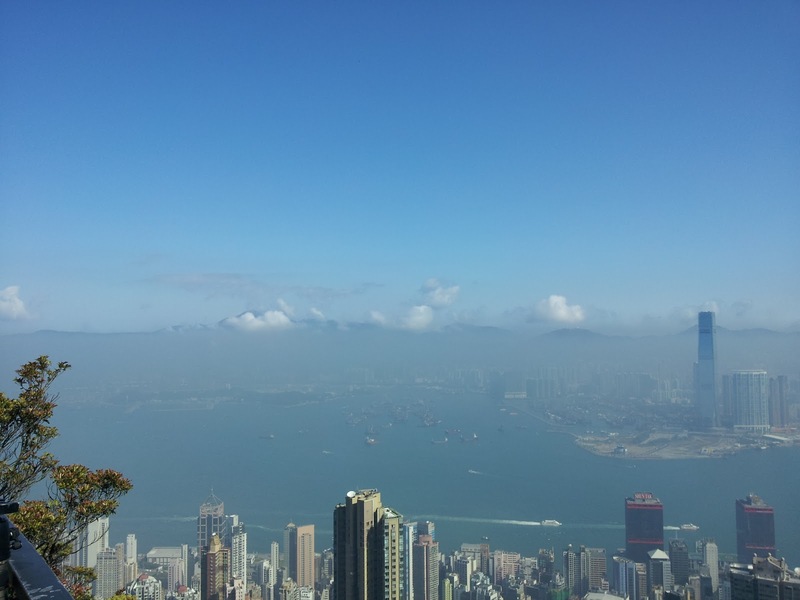 The Peak is one of the most popular destinations in HK attracting 7 million tourists every year. Not just tourists, this place is popular with locals alike who hike up the various trails leading to this mountain top to catch a glimpse of the picturesque views below or to just get a breath of fresh air. I have done this walk with my family before and while it is much slower it is filled with a different kind of fun. The initial bursts of energy, taking off into a sprint, the giggles, the shouts for water, juice, Yakult to keep going and then the sudden reduction in the decibel level….trudging feet, tired faces, pleading eyes looking up at their father for any kind of gesture or invitation to be carried on his big, strong shoulders, I enjoy it all! So one holiday instead of going for the usual food and fun kind of outing, we decided to take a ”little stroll” in our neighbourhood. We left home a little before 11 am carrying our rain jackets in a haveasack (it looked like a cloudy day), our food supply consisting of some crackers, a banana, two bottles of Yakult and a bottle of water. I was also carrying my Canon EOS 550D camera in a separate camera bag along with my wallet and a few must-haves like tissues, hand sanitiser, lip balm and chewing gum! We had decided to do the tried and tested route up to the Peak as before which involved taking a bus to Pokfulam Reservoir and then hiking up from there. However when we came to the bus stop, my husband spotted some steps going up the mountain on the opposite side of the road and on the spur of the moment he decided that we were going to take that route! Now although I had never walked up this path I did remember a friend telling me that she had and that it does lead to the Peak and involved some 500 steps. I am not very fond of steps actually and prefer walking up a slope instead, but this was a good change from routine. So we crossed the road with the boys and started the ascent. The boys were very happy counting the steps and they did so quite loudly as they walked up the first 100. To add to their excitement and fun I picked up a stone and carved out the number on every 100th step. We continued like this for the first 400, after which our pace started slowing down and we took a halt to take in the beautiful scenery. What we also realised at this point of time is that we had grossly underestimated the number of steps which were steadily increasing even after the count of 600! We put on a brave face and continued going up. That is when we came across this sign. This further charged up the boys who were convinced that this was the most difficult trek ever and that they were seasoned trekkers! I was actually quite impressed with the boys’ stamina and enthusiasm as they as they continued up the steps doing a steady count, maybe with a few misses here and there….800…850…900…950….980…990….997…998…999….1000! After some time, maybe over an hour, the steps turned into a slope, we continued but then I couldn’t believe what I found out! We had only reached Chi Fu! Now Chi Fu is a 10 minute walk by road from the starting point of our hike, so having reached here after a 90 minute strenuous walk was certainly not a very pleasant discovery. I tried not to look at my husband who was glaring at me for my 500 step casual prediction! Besides my man’s back was now plastered with sweat at having to carry our family haversack containing our ‘might-need‘ rain jackets and our meagre supply of snacks which remained untouched! I thought a little break at this time was called for and while we paused, I tried to bring back the lost enthusiasm, playing around with the boys, charging them up again. 10 minutes later objective was achieved and we continued our walk upward and onward giving each other little pushes when necessary. By the time we reached the top, my little boy was taking a ride on my husband’s shoulders! Needless to mention after our 2+ hour hike reaching the top had never felt more thrilling or fulfilling!